One of the places I have always wanted to go to in Manchester would be the Trafford Shopping Centre. It is one of those places that just seems to have the ability to draw people toward it. It is perhaps the reputation that goes before it. Maybe it also has something to do with Old Trafford and the football stadium that draws us in as my boys are huge Man U fans (don’t ask me why, almost all the kids up here are). Whatever there is to do, and there is a lot – I think I would have to have a pocket full of money before I headed down from Aberdeen again. I spent a week there in 2003 for work, and I always vowed to go back, but sadly I haven’t made it down again yet. There seems to be plenty of things to do in Manchester, and if my children were to have a say in where we go and what we do, then they would definitely decide to visit the LEGOLAND Discovery Centre as they are lego maniacs. 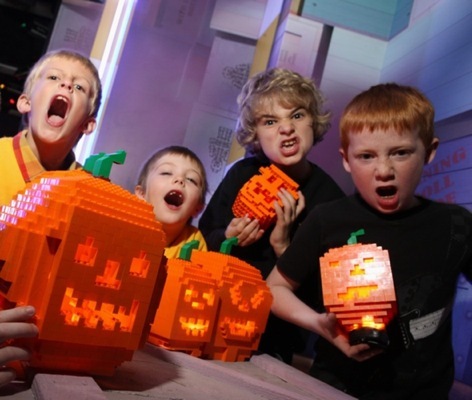 Halloween Manchester style seems to be overwhelmingly colourful at the LEGOLAND Discovery Centre, where they are holding a monster mash LEGO building challenge every day between the 15th and the 31st October. I have a family pass which will allow up to 2 adults and 2 children to experience the LEGOLAND Discovery Centre park for a day. Leave a comment to say what your favourite memory of lego is. Leave your contact details in the comment, ie email address or twitter id so I can contact you if you win. – If the winner has not claimed the prize within 3 days, I will redraw another by random generator. 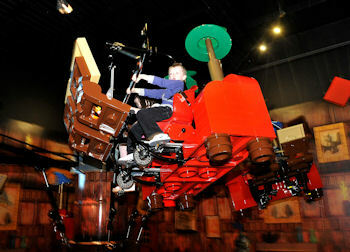 Great for boys… and girls who like building… The rides are not really much to get excited about. The 4D Movie was well made for a Lego film. My kids spent most of their time playing with… Legos. Eat somewhere else. The tables seem to be filled with bored parents waiting for their kids to get bored. So if you don’t want to eat standing up, eat before or after. I visited legoland trafford Centre during school holidays and it was very busy with a big queue so i would recommend purchasing tickets in advance. Great for boys… and girls who like building… The rides are not really much to get excited about. The 4D Movie was well made for a Lego film. My kids spent most of their time playing with… Legos. Eat somewhere else. The tables seem to be filled with bored parents waiting for their kids to get bored. So if you don’t want to eat standing up, eat before or after. I used to love making motorhomes – I’d build a real fantasy zone lol – pool, disco room, bedrooms for friends – everything went in! I remember needing to put dozens of wheels underneath the things were built so large lol – hours of fun! I loved playing with lego. I remember my first box was quite basic but then I got another box so them two combined was a great fun. I loved doing the designs from the booklet. Favourite memory of lego is playing with my grandchildren, building animals. My memory of lego is building the tallest tower and knocking it down. my favourite memory is building towers to see how high we could get them before they fell! my brother always made bigger towers then me! building a massive house for my barbies!!!! Me and my sister loved trying to build the tallest tower. The best bit was knocking them down of course! Lego is a toy which lasts generations! My 4 year old has my Brothers lego which has been passed down and down and down, we just buy new and add to it. So my memory is being reminded everytime it is brought out of all the fantastic and different models that they have all made and how each childs imagination builds something different and unique. i remember playing with my mum, bother and myself for hours, we laways made a house, and the lego i played with as a child i still have and my children play with it now! My first memory was of my older sister building ships so both of us could play together, she had loads of boats and loved them as my dad worked on them. i remember building tiny houses, & trying to make whatever came to my imagaination! My favourite memory of Lego is actually sorting the colours and shapes into containers. I’m still the same today, although not with Lego! I also used to love putting it in a pillowcase and washing my Lego in the washing machine, can’t actually remember building anything though. I remember when opening a new box of Lego there was usually only a small amount of window panes and as the only thing i was any good at making was houses I would be prepared to actually get into a fully fledged fistfight to make sure i got as many of them as i possibly could lol. I love lego! I used to play with this for hours as a child! Please let me win!!! As a child, making endless dogs out of lego because my houses never worked properly and ended up lopsided. As an adult, watching the hubby play lego with our nephew, and seeing them make a whole town (a crazy town at that) with it. …My contribution still ended up lopsided. Watching the smile on my son’s face while he is playing with his daughter with the lego that father christmas gave him 34 years ago. Watching my granddaughter play with the lego that father christmas gave her dad 34 years ago and seeing the smile on his face at the pleasure of playing with it all over again. Thinking that the orginal lego land – in denmark – was a real place. I remember getting a huge box of Lego for Christmas one year. It was the one gift I was allowed to open on Christmas Eve that year as the wrapping was a bit torn. It gave my Dad and I hours of Lego building, listening to Billy Joel whilst my Mum was working in the evenings. I loved Lego technik and remember building the car – it took about a week!